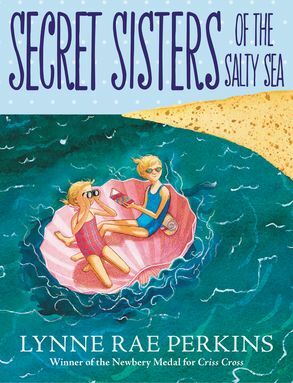 Take an unforgettable vacation to the beach with two sisters make friends, go exploring, and have adventures both big and small. Newbery Medalist Lynne Rae Perkins introduces two irresistible sisters—Alix and Jools—and takes readers on an unforgettable vacation to the beach. This joyful celebration of sisters, family, friendship, and the ocean is illustrated in black-and-white throughout. The Wall Street Journal said, “Ocean meets sky meets two young girls in Lynne Rae Perkins’s affectionate chapter book. . . . Illustrations by the author add wit and tenderness to this sunny summer story.” For fans of Kate DiCamillo and Rebecca Stead. Alix and her older sister, Jools, have never been to the ocean. When their parents pack them up to spend a week by the shore, Alix is nervous about leaving home—but excited, too. At the beach, the sisters make friends, go exploring, and have adventures big and small. To Alix’s surprise, as the week comes to an end, she finds she doesn’t want to leave! Each chapter contains its own miniature discovery—from picking periwinkles, meeting a crab, and making sandcastles, to exploring the nearby town. Award-winning author Lynne Rae Perkins has beautifully crafted a genuine and engaging novel about sisters, family, and exploration. A great read-aloud, as well as a good choice for newly independent readers. Booklist said, “Ordinary pleasures, in the hands of a writer so skilled, are elevated.” Features black and white art throughout.